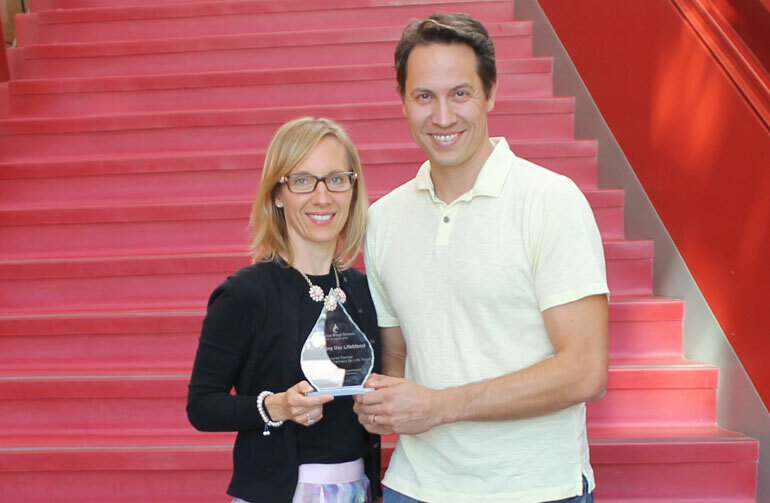 UBC Okanagan Partners for Life Program Champions Natalie Murdoch (School of Nursing) and Warren Brock (Southern Medical Program) with their Honouring Our Lifeblood national award from Canadian Blood Services. The UBC Okanagan Partners for Life Team was recently recognized at the 2017 Canadian Blood Services Honouring Our Lifeblood award ceremony for significantly increasing the number of blood donations from students, faculty, staff and alumni. Donated blood and blood products can be used for a variety of medical treatments. Red blood cells are generally used for emergency care or surgeries, while platelets and plasma help cancer patients or those undergoing extensive surgery. The Canadian Blood Services Partners for Life program works with companies, government agencies and community organizations to encourage people to donate blood, platelets and plasma as a group. The UBC Okanagan team was selected as the 2017 BC and Yukon regional representative for program excellence. Brock attributes much of the team’s success to effective partnerships with various campus groups including Athletics, alumni UBC, and student blood and stem cell clubs. In particular, students from the School of Nursing have played an integral role in recruiting new blood donors as part of their program studies. UBC Okanagan now hosts three to four blood donor clinics each year boosting the team’s ability to recruit new donors. Brock says they hope many new recruits will become lifelong donors, who contribute regularly to Canada’s blood supply and the team’s continued growth. The next on-campus clinics are scheduled for September 27, October 25 and January 17.